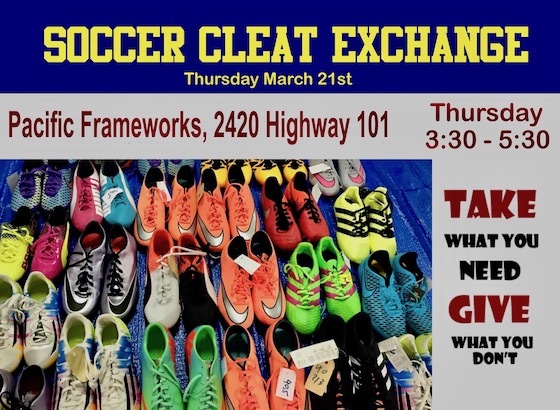 The Siuslaw Youth Soccer Association is holding both a cleat exchange and a bake sale from 3:30 p.m. to 5:30 p.m. Thursday at Pacific Frameworks, 2420 Highway 101. Money raised from the bake sale will support the Siuslaw High School soccer team. The SYSA celebrated its third anniversary of official registration on March 2. Practices for the spring season begin after spring break. Games will be played Saturdays, April 13 through June 1, with a break May 18 for Rhody Days. For more information, go to the club's website, www.siuslawsoccer.com. The club also can be contacted at siuslawyouthsoccer@gmail.com or by phone at 541-600-4409.